Belle and I decided to start the New Year with both; the new and familiar. We were able to do this by a return visit to The Saturday Market at Rebus Works in historic Boylan Heights. Belle wanted to replenish our stores with some meat selections from a local farm, Cooterville Farms. Both of us wanted to try “rookie of the year food truck” nominee, Bam Chow Pow, which just happen to be serving at the market on this Saturday. We wanted to sample their signature tacos, which consist of a half-folded deep fried egg roll wrapper, with a choice of; beef and bacon, cold smoked catfish, pulled pork or mushrooms with arugula and roasted red peppers. We ordered the sampler so we could taste each of the tacos. Our favorite taco was the beef, with the pork coming in second. When we got to the window to place our order, Belle and I introduced ourselves to Chef Sean and his wife Lauire. Before ordering we discussed the inspiration behind their food truck and selections they offer in addition to how they liked the Triangle Area. Sean took this opportunity to tell us about an event he was eager to serve at LoneRider Brewing Company this upcoming Wednesday night. He was planning a menu to compliment the special cask tapping. When he described the menu, Duck leg confit ravioli with Swiss chard, butternut squash puree, pickled onions, five-spice veal jus and basil foam, we were fascinated. This was the opportunity Belle and I had been waiting for – pairing a visit to ‘The Hideout’ with something as decedent as duck leg confit ravioli seemed serendipitous. Wednesday was a brisk night for Raleigh but Belle and I ventured out to one of the Triangle Area’s admired breweries, LoneRider Brewing Company. We had put off this visit, but knew full well an opportunity to visit would present itself. As it happened this would be the night. There would be a special cask of ‘Sweet Josie Brown Ale’ infused with raspberries and chipotle, and a special food pairing of duck leg confit ravioli, an amazing presentation from Bam Pow Chow’s Chef Sean to complement this cask. Since it would be a while before the special cask would be tapped, I started out with a Sweet Josie Brown Ale, a favorite that I had enjoyed on several occasions at area establishments, and took this opportunity to take in the ambiance. Ironically, ‘The Hideout’ reminded me of many of the dive bars dotted all along the Overseas Highway, from one end of the Florida Keys to the other, I had frequented in my youth. With the exception that The Hideout is devoid of boat-drinks and Hemmingway look-alikes. Most of the patrons seemed like regulars, and weren’t hiding under a palm tree, or an assumed name – for that matter. Our bar tender, Christina Osier, seemed professional and popular among her guests. Before long, the Sweet Josie Brown Ale infused with raspberries and chipotle was tapped and portioned out to eager, thirsty patrons. Next, Lauire came in from the cold, took our orders, and promised to return promptly. While waiting, I sampled the Sweet Josie Brown Ale special. It was rich with subtle tones of raspberries and a slight hint of the chipotle, nothing overpowering. Soon Lauire returned carrying two foil-covered plates. 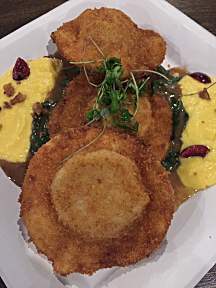 Peeling back the foil, what I found was astonishing; three crispy-fried raviolis, the size of beer coasters, elegantly flanked with butternut squash puree, garnished with pickled cherries, atop a veal jus and basil foam. It was by far the most impressive entrée that I have ever seen from a food truck to date! The ravioli were so plump with duck leg confit, that when I broke them open, seemed to expand two fold. To say that the portion was ample would be an understatement! I found the entrée to be incredibly balanced in every aspect, including texture. This was gourmet by every standard that my limited palate understood it to be, but there was more. No sooner than we had finished the Ravioli, when Lauire returned with dessert. Chef Sean had also prepared a Black Forest Cronut with a dark chocolate mousse, also garnished with brandied cherries. This meal had started splendid, but finished decadent. The Belle and I left the Hideout, appreciating Chef Sean was a true culinary master in every aspect of the phrase. 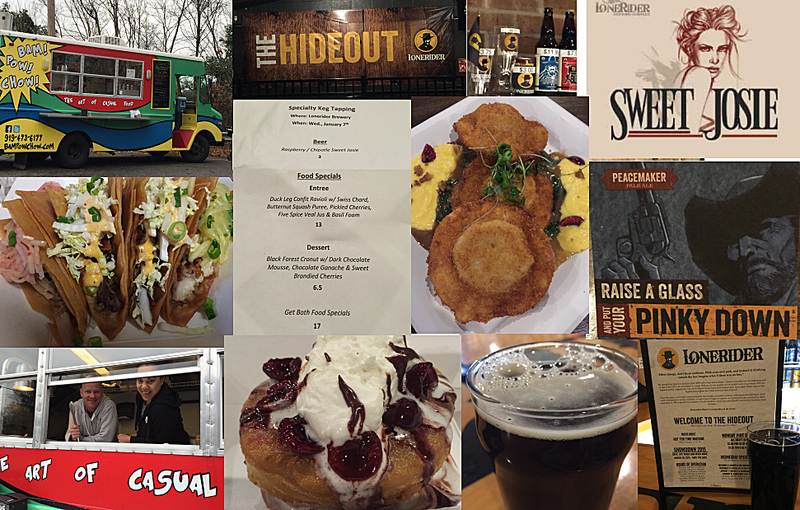 What is most amazing is the fact that he has chosen the simplest of conduits – a food truck – to convey his appreciation for culinary art to the people of the Triangle Area. I advise everyone to make an effort to sample Chef Sean’s culinary talents for themselves. 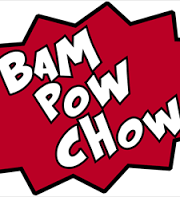 Check out Bam Pow Chow’s calendar for locations near you. I promise, you will be amazed, even delighted but not disappointed!